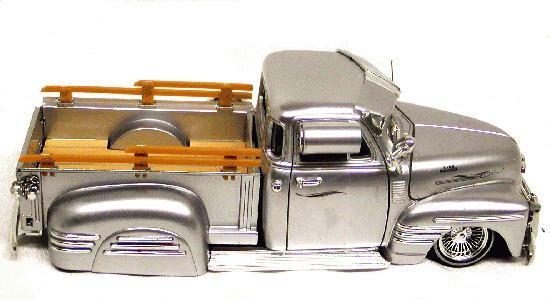 Our 1951 Chevy Pickup Truck Low Rider 1:24th Scale is by Jada and of the Street Low Rider Collection Series. The hood opens to reveal a beautifully detailed chrome engine & mock air conditioner. The back Tail Gate opens. The interior has a bench seats & chrome steering wheel. This model is free wheeling with fender skirts, chrome spoke rims and low profile wide stripe white walls.